Albert Decaris began engraving stamps for Monaco in 1958 with a 100f Airmail stamp issued 15 May. The stamp is one of a set of two. When I first started collecting Decaris stamps I saw this particular stamp and, to be honest, I didn't think all that much of it. But in preparation for this blog I did some research into the subject of this stamp and I was fascinated, which in turn gave me a new appreciation of the stamp. So without further ado let's take a look at the stamp and the story behind its subject. 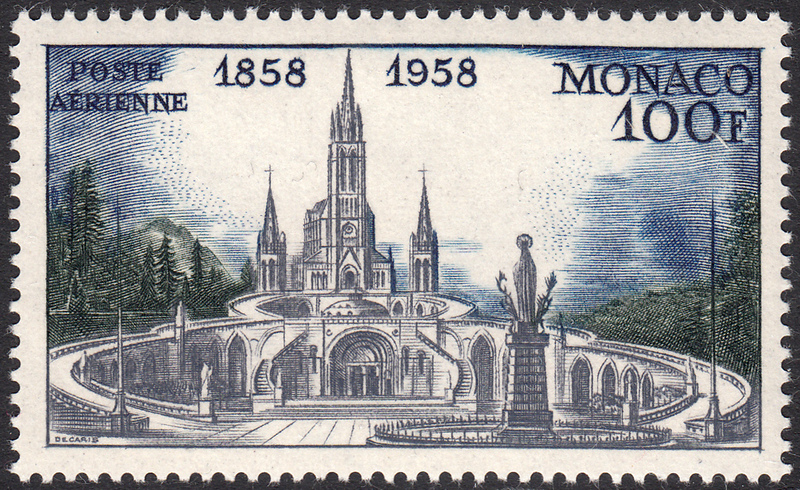 The subject of this stamp is the Basilica of St. Pius X located at Lourdes in France. It is a part of the Sanctuary of Our Lady of Lourdes. 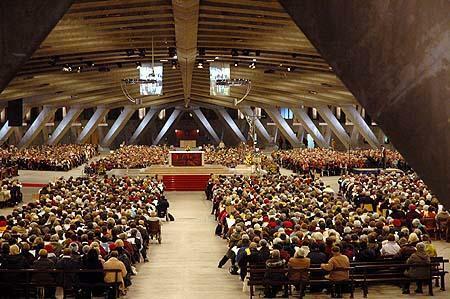 For those of you who are not catholic, the sanctuary is a major catholic pilgrimage site where it is believed that the Virgin Mary appeared to Saint Bernadette Soubirous on several occasions. These appearances are known as the Marial Apparitions. I personally remember learning about St. Bernadette when I was in school many moons ago. If you'd like to read more about St. Bernadette click HERE. Designed by architect Pierre Vago, the Basilica is also known as the Underground Basilica since it is almost entirely underground. And it is truly massive! When I first looked at some images from inside the Basilica I was staggered. It incorporates over 12,000 square metres of open space which can accommodate up to 25,000 worshippers. 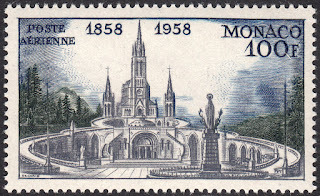 The Basilica was opened in 1958 - the same year as the release of the Monaco stamp - in anticipation of the massive crowds that would gather for centenary celebrations of the Marial Apparitions. Rather an amazing piece of architecture of which I knew nothing about until this morning. That's the beauty of stamp collecting for you. You never know what you'll learn next.